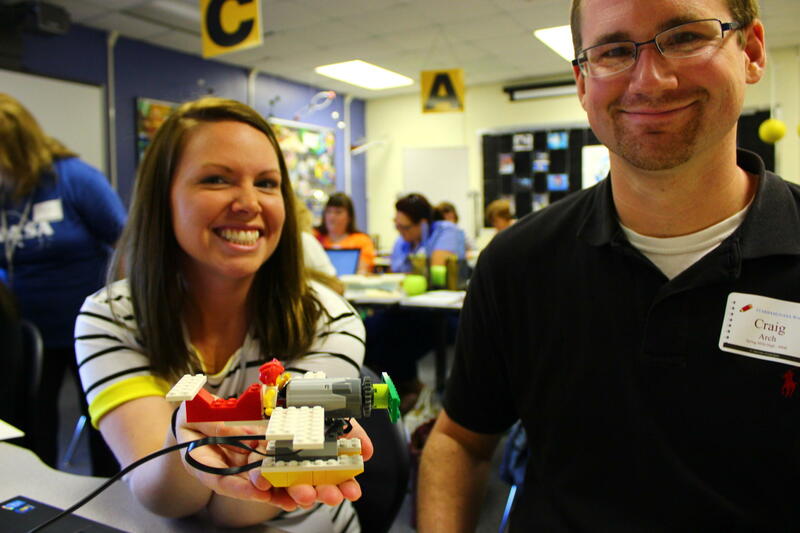 Two teachers show off their robot during the "WeDo Robotics!" lesson. Local elementary and middle school teachers in and around the Martinsburg area attended a NASA Teachers Workshop, Wednesday, hosted by STARBASE Martinsburg. 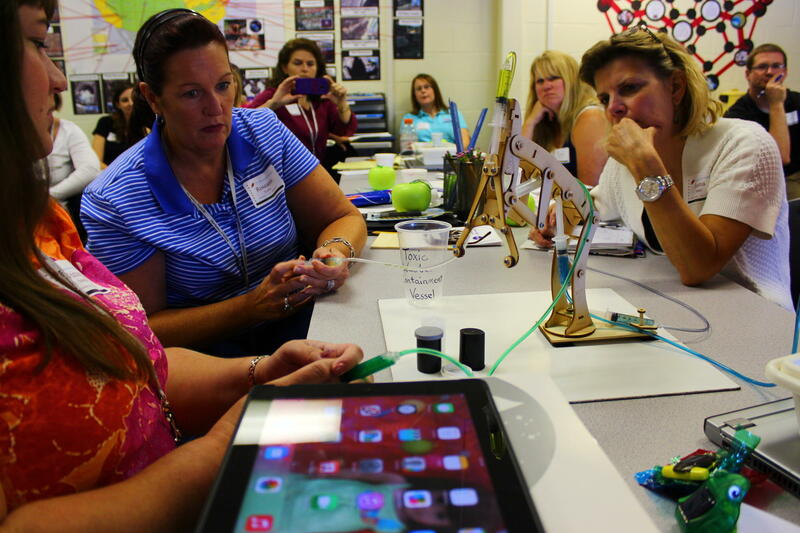 Going on its twelfth school year, STARBASE has hosted these workshops each summer to better prepare educators in the ever-evolving field of science and math. But the question is, with all the demands teachers face during the school year, can they effectively take the time for these new resources in their own classrooms? 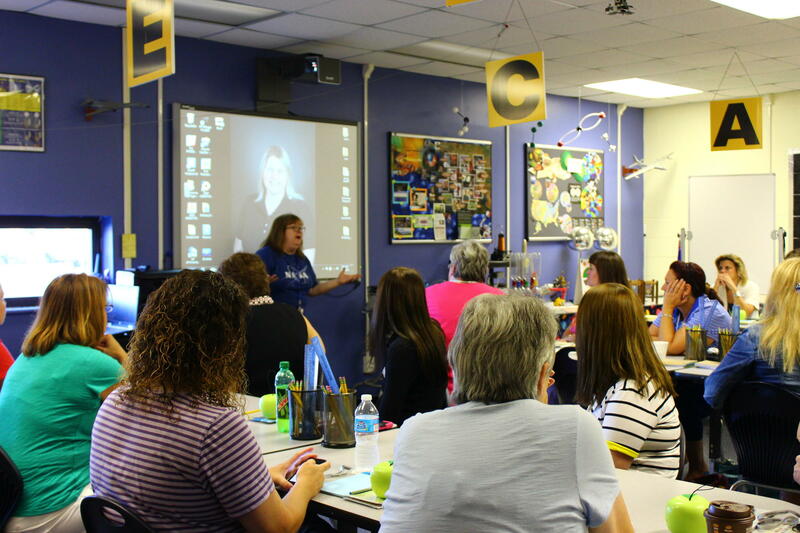 Pam Casto, a NASA certified trainer, led STARBASE’s NASA Teachers Workshop in Martinsburg. She taught two lessons titled, “WeDo Robotics!” and “Afterschool Universe,” aiming to help guide teacher’s keep their students engaged in the classroom as well as teach new and effective approaches to science and math, and Casto assures that incorporating these new lessons into teachers’ already busy schedules will be easy and fun. For third grade teacher, Heather McCain at Tomahawk Intermediate, her biggest concern is getting her hands on the equipment. Teachers work together to build and program their group's robot. To acquire the equipment, all a teacher has to do is attend one of NASA’s teachers workshops to learn how to effectively use the equipment and care for it. Matthew Collier, the head of the science department at Hedgesville Middle School says, it’s worth it. Angela Pittenger, a second grade teacher at Berkeley Heights Elementary School, thinks it’s important to change up the old and make way for the new, even if old ways may be stubborn to leave. Pam Casto, a NASA certified trainer, teaches lessons in improving the science and math curriculum for elementary and middle school teachers. In the morning lesson, “WeDo Robotics,” the teachers learned to build, program, and engineer robots from lego kits, which could be used to teach concepts in math, social studies, and science. In the afternoon, the teachers focused on an activity kit titled, “Afterschool Universe,” which holds twelve activities that focus on looking at the universe beyond our solar system. The small group of teachers left the workshop this week feeling positive about the changes they’ll now be able to implement in their own lesson plans.